This year’s Balik Cebu program that is among Sinulog 2014 activities will serve as the launching pad for a Balik Balay campaign that aims to help one of Yolanda-devastated communities in Pilar, Camotes. Balik Cebu committee members led by group chair, Tetta Baad, said their objective is to build 50 dwellings in the style of the bahay kubo in Sitio Esperanza in Pilar as soon as possible. The Balik Balay campaign will be officially launched during the Balik Cebu welcome party on January 16, 2014 which has served to welcome balikbayans during the Sinulog celebration for the last 12 years. Baad explained the committee, which is under the umbrella of the Cebu City Tourism Commission (CCTC), is primarily targeting the around 500 balikbayans who will be joining the welcome dinner for donations but would welcome contributions from other individuals, groups, or organizations. 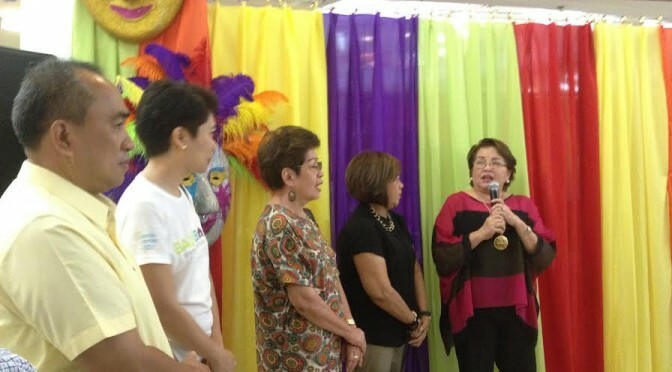 Balik Cebu committee chair Tetta Baad explains the Balik Balay campaign during the Balik Cebu booth opening at Ayala Center Cebu on Monday. She said Cebu Holdings Inc. has pledged 10 houses while there are another 3 from the Miss Cebu Charities, Cebu City Tourism Commission, and the Department of Tourism. Total cost of materials for one house, which will be 15 square meters wide, is P35,000, explained Baad. “The bahay kubo has gained from the cumulative expertise of our ancestors. Since it’s built on stilts, it’s flood proof. Instead of a tin roof, which can be blown away by strong winds, it uses nipa which is easy and inexpensive to repair,” she added. Since most of Cebu, Cebu City in particular, has been spared from the grave effects of both the earthquake and super typhoon Yolanda, it should therefore be helping those who have lost their homes and belongings, pointed out Cebu City Mayor Michael Rama. Cebu City Tourism Commission member Patria Aurora Roa said the situation in Esperanza is pitiful. They found out that the community is so remote that it failed to receive aid. The island of Pilar, where Sitio Esperanza is located, is nearer Leyte than Cebu and it is of one of Cebu’s emerging tourist destinations because of its white sand beaches, said provincial tourism officer Mary Grace K. Paulino. Baad said they visited Esperanza upon the request of Cebu Vice Gov. Agnes Magpale who requested assistance for the community and they were convinced that this should be the first beneficiary. The Balik Balay campaign is year-long and after building 50 houses in Pilar, the committee will be looking for another community to help. She added that the goal will be 100 houses and if there are excess cash donations, it will be used to build communal toilets, provide seeds for a vegetable garden and drums for water storage, as well as training on recycling and composting for beneficiary families.